You may see many different members of staff at North Bristol NHS Trust. Name badges are designed to aid the visually-impaired will form part of the uniform, helping patients and families or carers to identify who is who among nursing staff. If you cannot see the badge, ask them to show it to you. Our staff will not be offended if you ask them to identify themselves. The doctor in charge of your medical care is called the consultant. They will discuss your condition with you and offer you the best available treatment. They will have a team of doctors and nurses working with them and a member of this team will see you every day. If you want to know the name of the consultant please ask a member of the ward team. We are happy to be there with you when the consultant sees you. You will have a nurse who is responsible for your nursing care. They will also have help from the ward team. If you want to know the nurse’s name please ask any team member. The Ward Sister manages the whole ward and is supported by the ward manager. Please ask them if you have concerns. Our Matrons are senior nurses and each is in charge of a group of wards. Their job is to ensure that you receive high-quality care and that you are as comfortable as possible they can also help to solve a problem if the ward staff cannot. Our domestic staff make sure your ward is clean and that you get your meals, drinks and refreshments. If you have any worries about these things please ask any member of the housekeeping staff. 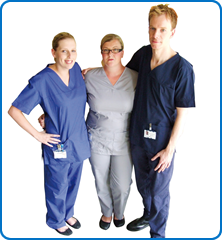 North Bristol NHS Trust is a teaching Trust so student doctors may accompany your doctor. We also have other staff in training, including student nurses, physiotherapists and occupational therapists. Students improve their clinical skills by working under the supervision of experienced staff and by having direct contact with patients. We may ask you to agree to be seen by a student doctor or other students and so help improve their clinical skills. Please be reassured that you can say no and this will not affect the care you receive. Your doctor or a member of the clinical team might also ask you to take part in a clinical trial or research study. These are important for developing treatments for the future. Again, please be reassured that you can say no and this will not affect the care you receive. If you have any concerns or questions, please speak with your doctor or nurse. Students will not be making any decisions about your treatment.